Wide Asleep in America: What's Missing from Reports on Rouhani's Donation to Tehran's Jewish Hospital? What's Missing from Reports on Rouhani's Donation to Tehran's Jewish Hospital? Mainstream media outlets are abuzz with the recent news that Iranian President Hassan Rouhani has presented a substantial governmental donation - reportedly as much as $400,000 - to the Dr. Sapir Hospital and Charity Center, Tehran's only Jewish hospital. Since taking office in August, Mr. Rouhani has embarked on a campaign to engage the world after years of isolation under his predecessor, Mahmoud Ahmadinejad, who never missed an opportunity to denigrate Israel and deny that six million Jews had died in the Holocaust. "Mahmoud Ahmadinejad, he ain't," crowed New York Faily News's Stephen Rex Brown. The U.S. government-run Voice of America reported, "President Rouhani's promise to attend to the needs of Iranian Jews is a sharp contrast to his predecessor Mahmoud Ahmadinejad, who denied the Holocaust and called for Israel's destruction." Yet these articles all fail to note a bit of crucial information. Rouhani is not the first Iranian president to donate money to Sapir. Ahmadinejad himself also did that. In 2007, Christian Science Monitor journalist Scott Peterson revealed that, during his first term as president, Ahmadinejad presented Sapir with a government subsidy of $27,000. It is unclear whether further donations were made during his presidency, though further government funding has been hinted at, either during this tenure or early in Rouhani's last year. 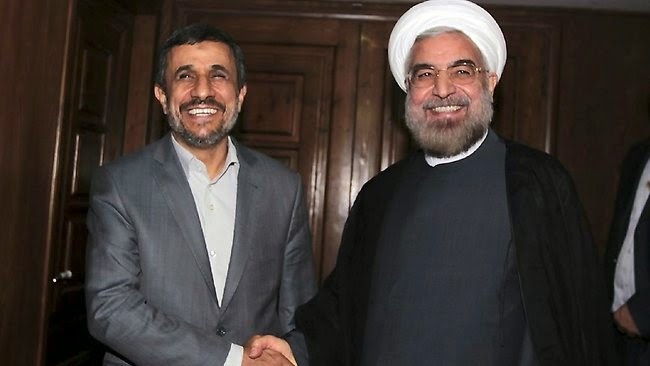 While the amount of Rouhani's reported donation totals exponentially more than Ahmadinejad's, the point remains that the caricature of Ahmadinejad as a nuclear-armed Hitler with similarly genocidal intentions has been continually cultivated by the media in the service of political agendas. In its piece on the latest funding, cribbed mostly from wire reports, the Times of Israel states that the donation stands "in contrast to Rouhani's predecessor, Mahmoud Ahmadinejad, who prompted an international outcry by denying the Holocaust took place while also calling for the destruction of Israel." The constant claim that Iranian leaders, and mostly notably Ahmadinejad, has called "for the destruction of Israel," demonstrates the almost sociopathic allegiance to propaganda ubiquitous in discourse about Iran. Though seldom noted, anyone paying attention to Western allegations and Iranian rhetoric knows full well that Iran has never threatened to attack Israel. The oft-repeated "wipe Israel off the map" line itself - misquoted, misinterpreted and endlessly exploited - has long been exposed and debunked. In September 2013, Ahmadinejad told CNN's Piers Morgan that "when we say 'to be wiped,' we say for occupation to be wiped off from this world, for war-seeking to wiped off and eradicated, the killing of women and children to be eradicated. And we propose the way. We propose the path." He explained (just as he and others, including Rouhani, have consistently for years): "The path is to recognize the right of the Palestinians to self-governance. Allow the people of Palestine to make decisions regarding their own future. Imagine one day in Palestine there is no longer occupation, occupation no longer exists in Palestine." That an end to occupation and the implementation of international law and equal rights would signal "Israel's destruction," says far more about the the inherent injustice and institutionalized discrimination of the Israeli state than it does about Iranian intentions. There are indeed clear differences between the Rouhani and Ahmadinejad administrations, their political agendas, policy platforms, and approach to public relations. But the media's willingness to ignore some of their positive similarities and consistencies reinforces a manufactured Manichean narrative and does a disservice to truth. Wide Asleep on Radio Dispatch, again!